A South Korean startup called UFirst has brought a nifty neckband to MWC designed for anyone who is deaf or has hearing loss. 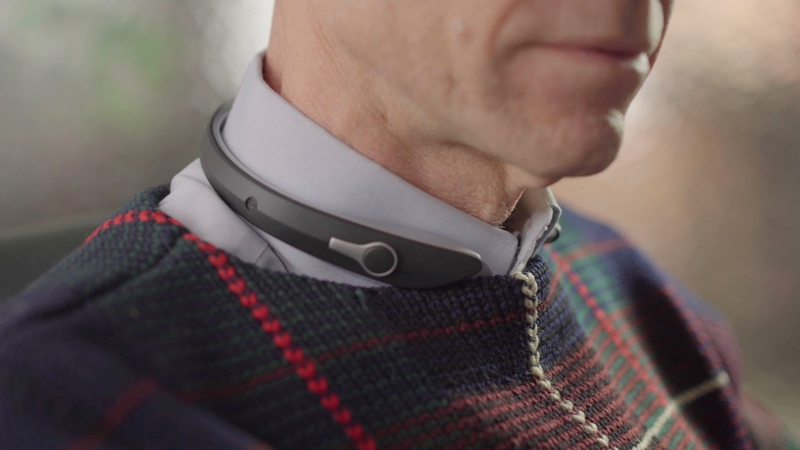 The Nuguna Neckband can pick up sounds in three directions and then analyse it and vibrate to notify the wearer where the sound is coming from. The team told us that the whole reason behind the product is that it can help people who don't like using a hearing aid - because they don't feel they quite need one, difficulty in noisy situations or faffing around using it. Wearing the 40g neckband instead of a hearing aid allows people with partial hearing to turn and listen/engage with a conversation or noise. It could also help to alert deaf people when they are out and about - traffic for example. Plus it's aiming to be more comfortable, with no side effects and with a design which reduces stigma too. So in the US & Europe, only 25% of people who need a hearing aid wear one and in the very image conscious South Korea, this is as low as 5%. And deafness is on the rise - 700 million people now but predictions estimate that as many as 15 - 20% of the population in 2031 will have hearing loss. The first gen Nuguna is due to go on sale in April 2017 at the affordable price of $200, much cheaper than most gear aimed at this segment of people. In the companion app, users will be able to set an alarm buzz as well as tweak sound thresholds for home and work as well as vibration duration and intensity. It's battery powered with a battery life between 50 and 200 hours, depending on usage, and connects to phones via Bluetooth. Then later in 2017, the UFirst team plans to launch a couple of new versions: a hearing aid model so you can use the noise detection then plug in the earbud when needed; a speaker neckband (designed to decrease the risk of noise related deafness) and a Neckband 2 with built-in earbuds again focusing on notifying wearers of high volume sound around them.